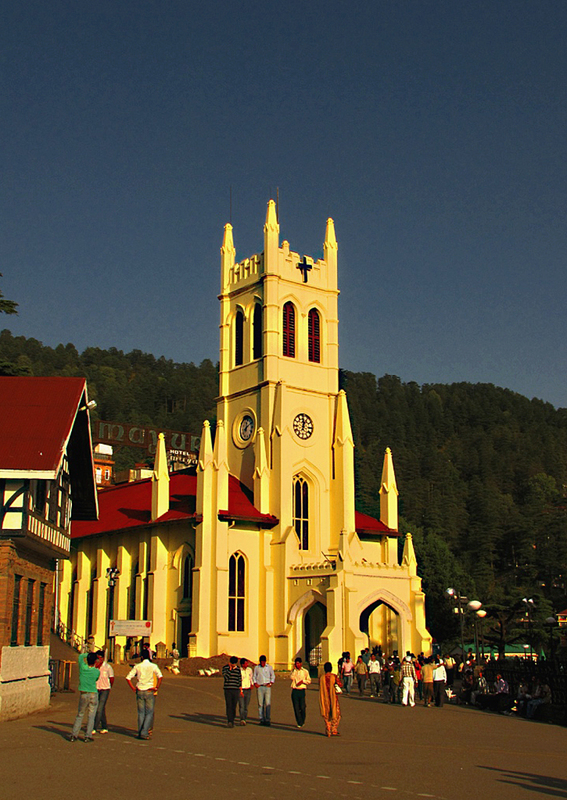 Once the summer capital of British India, Shimla- formerly known as Simla- has always been a star attraction for tourists from India and abroad alike. 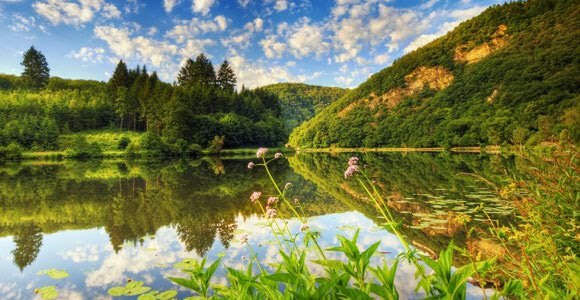 The city and its surrounding areas have amply been gifted with breathtaking views by nature and are draped in forests of pine, rhododendron and oak. Many parts of the city still retain the old colonial charm through the buildings styled in neo-Gothic architecture. 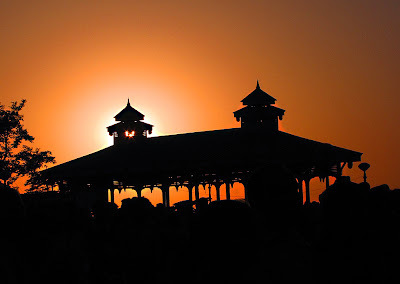 Shimla is situated at an altitude of 2205 metres and boasts of a very pleasant weather in summer when most of the north India reels under scorching heat. It were its awe-inspiring views and refreshing climate, that the British coined the term 'Queen of the Hills' for this place. And this term still holds good long after it came into existence. A shot of the city taken from atop a neighbouring hill. The sun is playing hide and seek. The rain shelter at the Ridge. The Ridge is the centre point for all activities in Shimla. Shimla is well connected with road and rail with rest of the India. There are regular air-conditioned and normal bus service from New Delhi, Chandigarh and many other prominent cities and state capitals. 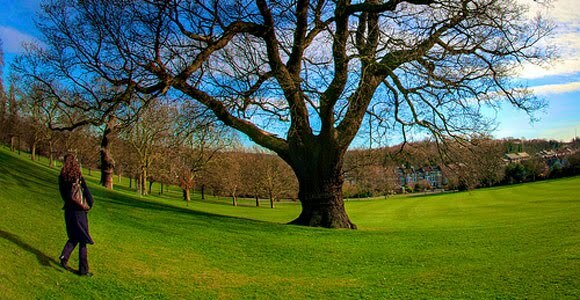 It takes around 4 hours to reach Shimla from Chandigarh by road. A narrow gauge railway line connects Shimla with Kalka, and Kalka is connected to Delhi by a broad gauge line and regular train service. 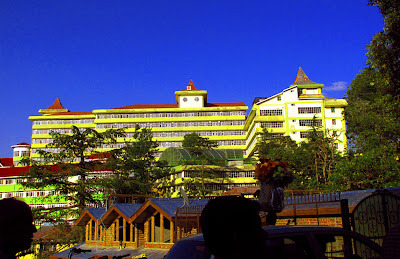 There is also an airport at Jubbbalhatti near Shimla, which is connected with Delhi via regular services. How about staying at a place where only a two-foot high wall and a short length of stone platform separate you from the sea and salty droplets wet your face every half-minute or so? Sounds exciting, no? 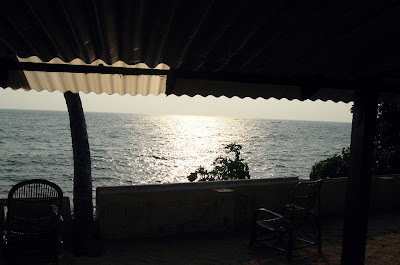 Well that was at Kollam where I had a cottage on the sea-shore for two days. In fact, Kollam is a place that offers one of the best backwater experiences in Kerala. The backwaters of Kerala indeed have a charm of their own. The narrow water-lanes meandering through villages; ethnic household situated on their banks; and finally those lanes emptying themselves into salty lakes! It is surely a not-to-be-missed experience to witness the rural life of Kerala flourishing along these water-lanes while sitting in a long narrow boat. 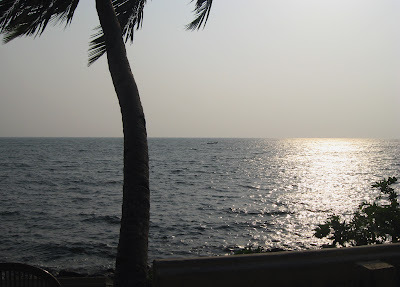 But, what I didn’t know was that my stay at Kollam was also going to be an equally memorable experience. 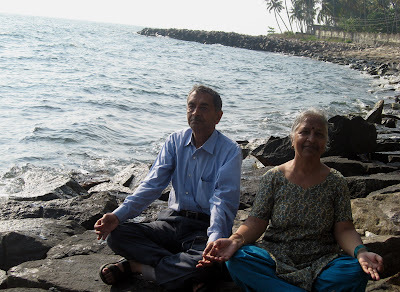 After spending two blissful days in the beautiful beach-town of Varkala, me along with my parents headed towards Kollam situated at a distance of 24 kms from Varkala. We had booked a room at one of the three Summer Houses in Kollam. All the three holiday homes are private properties having a total of nine bedrooms, though are duly recognized by District Tourism Promotion Council. Kollam has three beaches namely- the main beach called Mahatma Gandhi Beach, Tangasseri Beach and Thirumullawaram Beach. All three summers are situated on Tangasseri and Thirumullawaram. We had booked at House no. 3, which was on sea shore at Tangasseri. 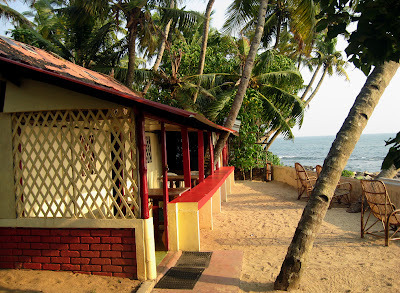 The magic of Varkala had not completely left our mind when charm of the summer house captivated us. The moment we stepped into this lovely holiday home situated at one corner of the city, we felt refreshed. All the stress seemed to vanish away in thin air. Suddenly, we were far away from the din and bustle of city life, and before us was the sprawling Arabian Sea hitting against the outer wall of the house. And we had reached an almost perfect place to watch sun immersing itself in the sea waves in the evening. The place is surrounded by coconut trees all around. The courtyard is spacious to relax in the evening. 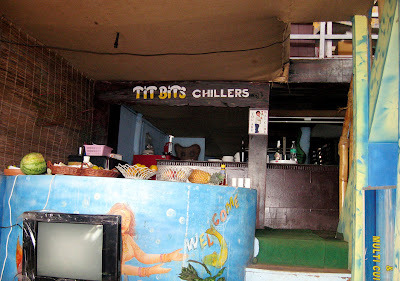 While I was making the reservation, I was apprehensive how we would do without an air-conditioner in warm month of March. Kerala becomes quite warm by the start of March. But, believe me it was so breezy at the summer house that we had to switch off the fan even during the day time. The sound waves were noisy during the day, but they seemed to be chanting in a rhythm during night. The summer house was being attended by a caretaker named Ram, who was always there to fulfill every need of ours with a smile never leaving his face. There was warm water in the private ensuite, tea and coffee making facilities in the kitchen, and a refrigerator stuffed with beer and packaged water. Ram made tea for us whenever we asked for it. The best part was the food, especially the seafood. They didn’t prepare the food there, but it came from a restaurant being run by the owner of the summer house. The food was fresh and yummy. While we paid for the lunch and the dinner, the afternoon tea and the breakfast were included in the room rent. Spending two days in the wooden cottage house was nothing short of being in paradise. There is cordoned off area in the sea that is safe for having bath. The house also provides fishing rods to keep you engaged. And above all, it was an awesome idea to sip ice-cold beer while sitting in the verandah in the dim lights of evening and gradually slipping into darkness of night, with water drops flying in intermittently to wet you all this time. And what’s more, we had the entire place almost to ourselves, as a Tsunami warning had resulted in a few cancellations. Kollam is a district headquarters and is very well connected through rail and road. It is situated on the banks of Ashtamudi Lake and is approximately 71 kilometres from the state capital city of Thiruvananthapuram. The nearest railway station is Kollam itself that is connected through broad-gauge railroad to almost every nook and corner of the country, and the nearest airport is at Thiruvananthapuram. The soft-spoken Mr. N. Sasi is the owner of all the three summer houses. For reservations and inquiries, he can be reached through e-mail at contactsummerhouse@hotmail.com or at +91-9895662839 or +91-474-2794518 on phone. 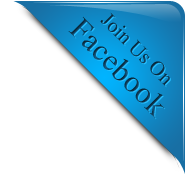 For more information, one can visit the website of Summer House. It had been not very long since I had read Ken Follett’s novel ‘Eye of the Needle’ that I happened to visit the sleepy town of Varkala in Kerala. The story of this novel revolves around the activities of a Nazi spy during World War II, involved in espionage within Britain. A major part of the story happens on a rocky island near Scottish shore. Imagine a huge mass of rock standing vigilant in vast expanse of sea; and saline waves roaring against its bottom! This image had been imprinted somewhere deep in my mind by the time I finished reading the novel. And I had no idea that the image was about to be realized soon at Varkala. Varkala- a tiny town at the southern end of Kerala! At first glance, it appears to be a sleepy hamlet in one remote corner of a vast country, and moving with a speed of its own. A quiet railway station with almost non-existent hustle & bustle and surrounded by lush green trees; a good number of taxis and auto rickshaws outside the station to take you to the beach; no bus stand, and people boarding a bus from the road itself; and ordinary eating outlets along the road, many of those running in kiosks. This image of Varkala does not change much as you go down the winding road towards the beach. The road runs for almost five kms. till it hits the cliff. And the moment you fill your eyes with the scene below you from the top of the hill, you see a different world altogether. That scene is still unforgettable to me. By the time I reached there, the Sun had started its final descent in the Occident, and the white sandy beach below me was shining in the evening light. The whole setting of the rocky island and the sea in Ken Follett’s novel was suddenly alive before me. The only difference was, whereas there was only one house on that island and it had only a couple of souls living there, here, in Varkala, were many resorts, restaurants and souvenir shops lining the single road on the hilltop and there was a huge crowd enjoying on the beach below. If you have had enough of the dirty and littered beaches of popular Indian tourist destinations like Goa, Mumbai or Chennai, then welcome to Varkala! The sand here is almost white in colour and shore edge is velvety. And as the sunrays deflected by the clean glassy beach soothe your retina, it feels like a paradise glowing in the golden light. Varkala beach is a strong contender to beaches of Phuket and Penang in beauty. That is why perhaps, you will find so many foreign tourists here- much more than what you will expect at more popular beach of Kovalam in Thiruvananthapuram situated only 50 kilometers away. The seaside resort town of Varkala is settled on a hillock. 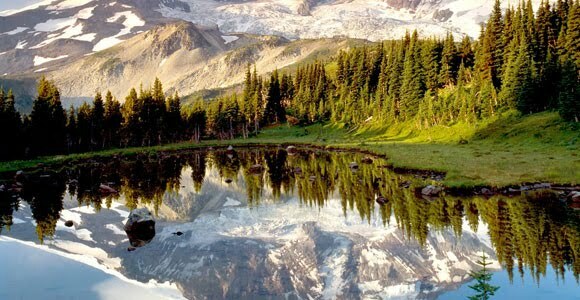 This hillock is part of a low mountain range called Western Ghats that runs along the western sea coast of India. 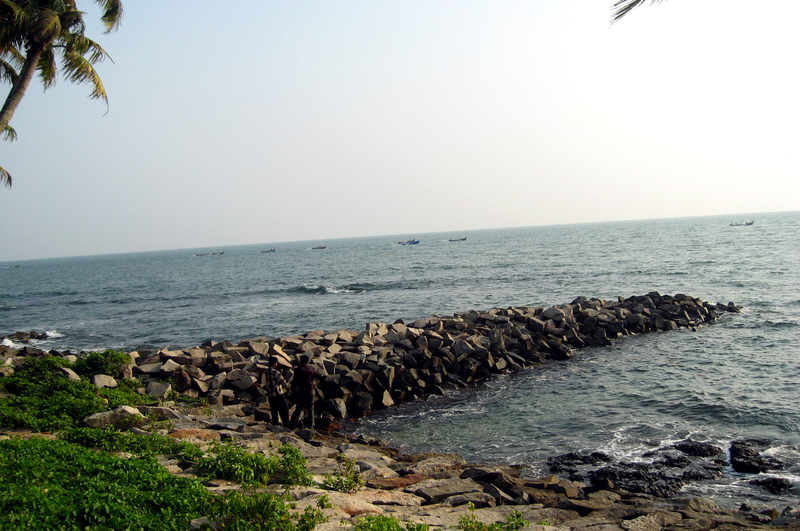 As compared to other places, these Ghats almost kiss the seashore in Varkala. The hillock in Varkala has two cliffs namely the North Cliff and the South Cliff. And at the bottom of these sharply sloped cliffs lies the gleaming sandy beach. If it is mentally refreshing to spend some time on the beach and get into a playful mood in the Arabian Sea, it is equally relaxing to have an overnight stay in one of the numerous home-stays there. Though there are many five-star resort hotels in Varkala, one can easily find budget accommodation, thus making it an ideal destination for backpackers too. 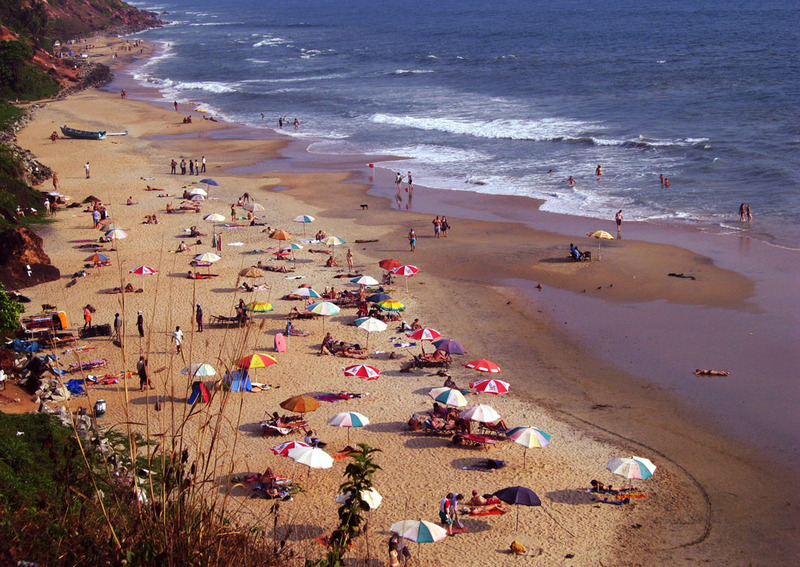 Although, the actual identity of Varkala lies in its home-stays, which offer true backpacking experience. The most of foreign tourists prefer to get mixed up in the local life rather than locking themselves up in a hotel room. Living like a guest with local families, knowing about the culture of Kerala, and savouring pure and delicious home-made local food… home-stay experience is really different and enriching. My destination too was one of those home-stays. After being tired from travelling almost for the whole day, I stepped into the courtyard surrounded by coconut trees… and what! All my tiredness vanished then and there into thin air. On one side a swing; and on the other some young guests sitting on a mat and laughing heartily! A well for fetching drinking water from; and a candle light dinner with Keralite dishes while sitting on a cot! It felt as if all the guests staying there were known to each other since long and a part of an extended family. Having local food at a home-stay has a charm of its own, though one has an option of having meal at one of the restaurants on the cliff. If one is in town, then there also are numerous food outlets serving all kind of food. The restaurants at the cliff can offer you mesmerizing ambience- music playing amidst dim lights, a roaring sea just beneath you, and fresh seafood... What else one wants! Bet it, you won’t forget this dinner. And if you wish, you can buy raw seafood here and get it cooked to your own taste and choice. Varkala is indeed a paradise for food lovers. Health conscious people also have something to rejoice in Varkala. They can have Ayurvedic massage and spa at very reasonable rates and there are several such centers where you can say goodbye to your physical and mental fatigue. If Varkala is one of the best destinations for those who love comfort and sophistication at an affordable price, it is no less important from religious point of view. Here you can visit Janardhana Temple that is 2000 years old. It is not very far from Papanasham beach which literally means ‘destroyer of all sins’. This place is religiously so important for local people that they call it ‘Kashi of the South’. In addition, Sivagiri Math in Varkala is also a centre of religious activities. This was founded by great saint and philanthropist Narayana Guru. A festival is celebrated at Sivagiri from December 30th to January 1st every year. 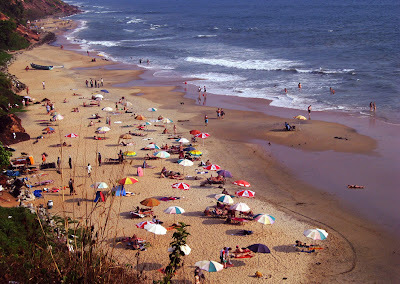 Situated about 50 kms from Thiruvananthapuram and 25 kms from Kollam, Varkala is easily approachable by bus and train. Train travel is far more convenient. The name of the railway station is Varkala Sivagiri. Not every train originating or passing through Kollam or Thiruvananthapuram stops at Varkala Sivagiri station. Check out before you board a train. 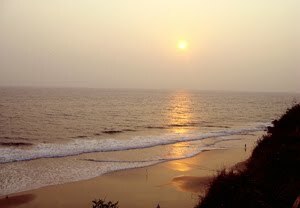 Varkala beach and the cliff above have many eating and drinking outlets where one can have a memorable dinner while enjoying cool and misty sea breeze. 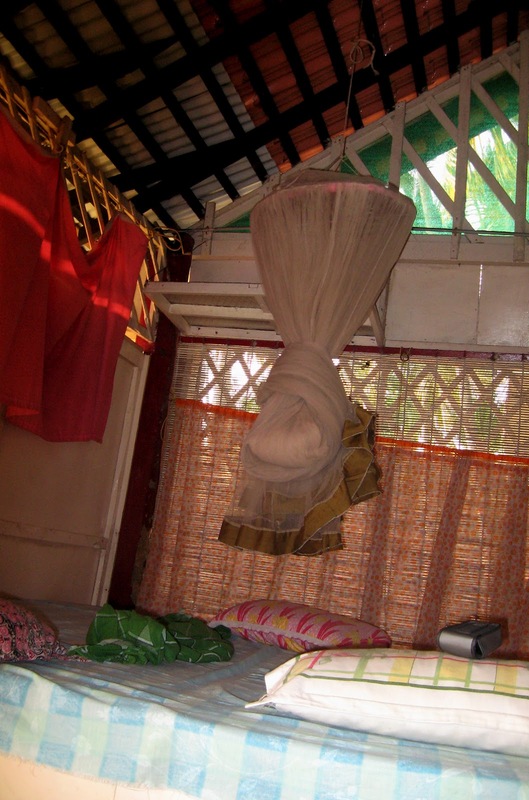 I had booked my home-stay on internet and it was a bit costly as compared to others. 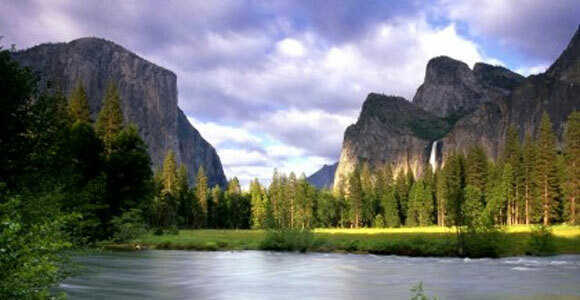 But there are many home-stays to choose from and not each of them is offered on internet. One can get a cheaper option even after getting to Varkala. 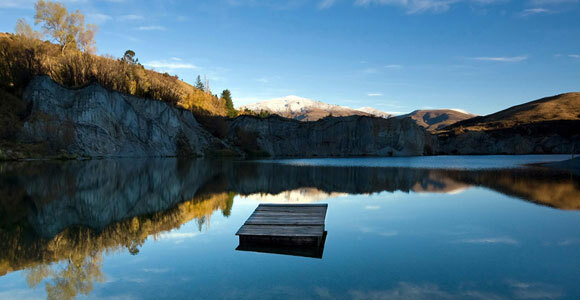 Before you choose a home-stay, do inquire about the facilities they provide there. Don’t forget to ask whether breakfast is included in your room tariff or not. Sometimes it is there but they will offer it only if you ask about it. If you intend to spend much time in Varkala, rooms are available on rental basis.